Last week, I went on an amazing tour with Kiwi Experience, I took the Geyserland and Lake pass. 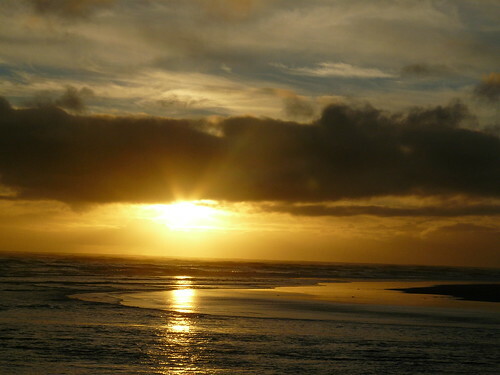 We visited Hot Water Beach, Waitomo, and Rotorua. On Wednesday morning, the bus driver picked us up at the Kiwi Experience office and we took off for our backpacker adventure. Before we went out of Auckland we did a quick toilet stop at the Auckland Domain and here our bus driver told us everything about the Kiwi Experience adventure, safety, activities, and accommodation during the bus trip. After that, we started our journey to Hot Water Beach, our first stop of the bus trip. My bus driver was really amazing! He was really funny and knows everything about New Zealand. He tried to help us as much as he could with our travel and activities and he really wanted us to have fun. During our trip to Hot Water Beach, we stopped once in a little town with a shopping mall. We had some time to do some groceries and get some lunch. We stopped nearby a PaknSave, the cheapest supermarket in New Zealand. Kiwi Experience is really trying to think about your money and tells you when there is time to do shopping and they will tell you where you can find cheap food. Around 14.00 pm we reached our hostel in Hot Water Beach and we had about 30 minutes to check-in, go into your room and get changed. Then we went for our first activity of the trip. The bus took us to Cathedral Cove and we had to walk 45-minutes down. It was a really easy hike and the moment you reach the beach is breathtaking. This beautiful spot was used for the movie ‘Narnia’ and it was one of the locations in the music video for the song ‘Can’t hold us’ by Macklemore & Ryan Lewis. We spend an hour around the beach before we went back up. When we visited the beach, the weather was really great and the view looked like a brochure picture. We went back to the hostel for dinner and we eat some fresh fish and chips. We were not able to get to Hot Water Beach before 12 pm. We missed the low tide at daytime so we went to the beach at night. This experience was amazing! We went with the whole Kiwi Experience group and had to find our way in the dark. At the beach, we had to find the perfect spot where we could mix hot and cold water to make our own natural Jacuzzi! The sky was clear, so we sat under the stars and had a perfect night in the hot water. This activity is definitely one of the best experience I’ve ever had! The next day we were really tired, but we had to get up really early because of our busy day. Most people slept the first 1,5 hours on the bus and after that, we had our first stop to get some breakfast and do some groceries for Waitomo. After our break, we did a short hike track in Krangahake. Our bus driver guided us around the track that leads us through mines. Next, we went back on the bus and continue our drive to Waitomo. During the ride, different accommodation and activity sheets were given and you could sign up for everything you wanted. I signed up for the Maori dinner and accommodation in Rotorua the next day. When we reached Waitomo, we first had to get out tickets for the Glowworm caves and the Maori dinner or sleepover. After that, we went to the hostel and we had some free time. Around 3 pm, 10 others and I were picked up at the reception and we went for the Black Labyrinth in the glowworm caves! This tour was really impressive. We had to climb and walk in the caves and when we reached the water we did the cave tubing and some small waterfall jumping. The most impressive moment was when all the lights went out and you could see all the glowworms in the caves! The next day we left Waitomo to go to Rotorua. After a 10-minute drive, we stopped for a short morning hike and afterward we left for Hobbiton. I did not go to Hobbiton this time, but we had some really nice weather so the people that went on the tour had a perfect day! The people that did not choose to go on the Hobbiton tour left for the OGO balls in Rotorua. I went in the OGO balls with one other girl and it was so much fun! First, we did the Straight Track, where you race another OGO balls downhill. The second time we did the Sidewinder Track, this is de world’s largest track. When we had to wait we could just chill in some outside Jacuzzi and enjoy the view over the Rotorua lake. After a while, our bus driver picked us up and we went to our hostel in Rotorua. I stayed here for two nights and enjoyed my time with different people in the hostel. The first night, I went with the Kiwi Experience group to Tamaki, the Maori village. This cultural experience is amazing! You will learn a lot about the Maori culture, they will show you Maori dances, tell you stories and they will sing old songs. After that, we got some traditional food that they cooked beneath the ground on hot stones. 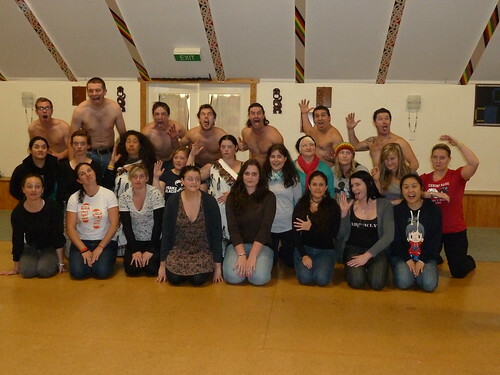 They will end the evening with all the guys performing the Haka and some lovely songs. The next day, I left the Kiwi Experience group and went to explore Rotorua. In the afternoon, I visited the Redwoods with some people I met in the hostel. This forest is really beautiful and you can choose to do the free hiking tracks or go for a tree walk at day or night. We ended our trip in de Lava bar that is next to the hostel! On my last day, I went on another Kiwi Experience bus and went back to Auckland. Before we left Rotorua, we stopped at the Rainbow Springs Nature Park to learn something about the kiwi birds in New Zealand. We got on a tour and saw some baby kiwi along the way. After the tour, my trip was done and we went back to Auckland. My experience was really great, I had the opportunity to see many beautiful places and enjoy many different activities! This entry was posted in new zealand, Travel and tagged Hot Water Beach, KIWI Experience, new zealand, North Island, rotorua, travel, waitomo on September 29, 2017 by INTERNeX New Zealand. It was really adventuresome this time, because I joined two friends of mine, who started their big trip through New Zealand in a Campervan! So I got the unique chance to overnight at a wonderful place in Taupo for free. We started the trip Friday midday in Auckland and first drove to Waitomo, where the friends of mine explored the Waitomo Caves via Blackwater Rafting and I visited the Waitomo Discovery Centre to learn about the formation of the Caves and the history of their exploration. After that we planned to do the Tongariro Crossing the next day, but because of the weather it was impossible, so we had to think about a new plan. We decided to spent the night in Taupo, because its a big city with a huge range of activities. 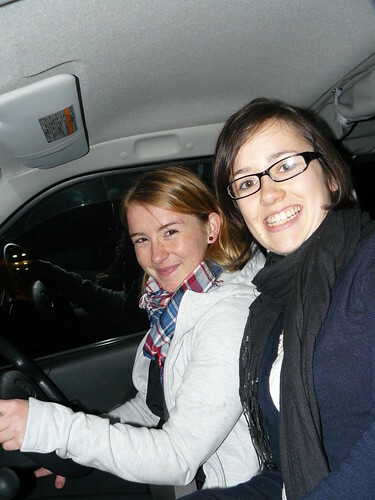 So we drove through the night and it was so much fun, exploring the country with the Campervan. After shopping some food for dinner we found a really nice place at Acacia Bay, where we enjoyed some pasta and a wine for dinner. 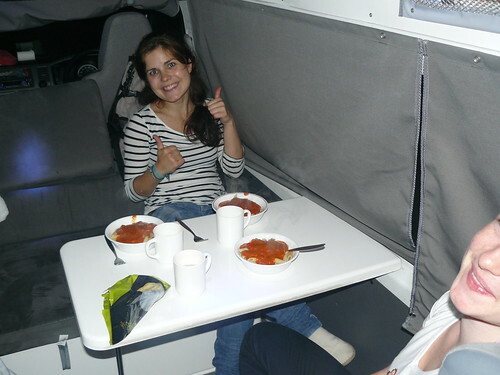 Ever tried to cook in a 4 square metre kitchen-living, and sleeping room? A real chaos with three girls but also much fun! The next day we woke up really late, due to the sleeping comfort of the Campervan. It took us 3 hours to get ready! Because of the ongoing rain we decided to spend the next hours at the AC Bath in Taupo (http://taupovenues.co.nz/ac-baths/home/) with 35 degree warm water and a sauna. The best thing you can do at a rainy day! At the Friendscafé at the promenade of famous Lake Taupo we had coffee, pie and a nice chat with the waiter before I said goodbye to the girls. They continued their trip to Palmerston North. Safe travel for them! After a good night I travelled back to Auckland by bus on Sunday and enjoyed again the beautiful landscape of New Zealand. So hope you guys are getting some new ideas for travelling now cause this is what you should definitely do here. Hope to hear from your experiences. This entry was posted in INTERNeX, new zealand and tagged ac bath, adventure, blackwater rafting, campervan, INTERNeX, new zealand, taupo, tongariro crossing, travelling, waitomo on June 21, 2011 by ixcaroline. Lets tell you something about an awesome trip! Hope you guys are fine and enjoy your time in New Zealand. Maybe you are already thinking about traveling after your workexperience or during a break. As you may have noticed I do this a lot and in every way you can imagine. And last week I had the possibility to travel with Stray. Paul and I went on a Stray trip with some other guys from the travel industry in New Zealand and Australia. We got a really good impression of what it means to get “Further off the beaten track”. Seeing some really unique places around the central North Island that makes Stray such a great tour company. We started our five days full of action in Raglan, where we had been Surfing in Winter and met the owner of the amazing lodge Charlie and his wife on a beautiful sunset cruise in the Raglan harbour. The next day we went to The Waitomo caves, doing climbing, abseiling and crawling through really small places in the caves. For me it was one of the biggest challenges I have ever confronted in my life and definite must-do! After everyone got dry again we made our way to the East Coast of New Zealand. In just 5 hours we crossed this wonderful country and ended up at a traditional Maori marae (meeting house) Here we watched a Maori cultural show, enjoyed a typical Hangi meal and all slept together in the marae. On the third day we went on to the National Park, stopping at a secret place for swimming in the hot river and visiting the Huka falls. We made a short walk in the beautiful and impressive Tongariro National Park and after a delicious dinner in the National Park Lodge we celebrated the Birthday of our fellow travellers. The last day we went on to the amazing new overnight stop of Stray – the Blue Duck Lodge – where we met Dan and his crew again. He and his team made our stay an unforgettable outdoor adventure again. After doing a whole bunch of activities like Jetboatriding, 4-wheel-driving and clay-pigeon shooting a lot of us thought about coming back to this hidden and unique place in New Zealand one day again in the future. Exhausted but happy and full of new ideas we came back to Auckland on Sunday. With a lot of new friends and satisfied I can say travelling this way is really safe, adventurous and definitely a lot of fun. So if you like to have an organised holiday with many possibilities for activity and unique adventures you should hop on a Stray bus. You can ask me any questions about Stray and if you want to book a trip you can book it with us here at INTERNeX as well. Thanks to the Stray-team for a wonderful trip! 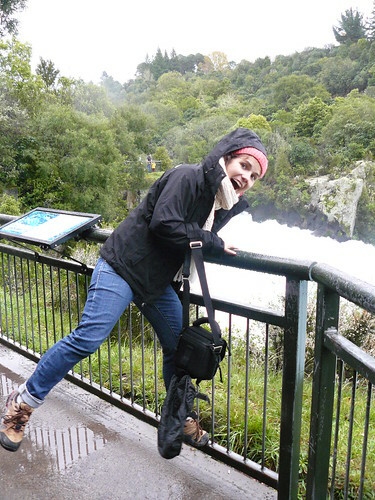 This entry was posted in INTERNeX, new zealand and tagged blue duck station, huka falls, INTERNeX, maketu, marae, new zealand, raglan, stray, tourism, traveling, waitomo on June 14, 2011 by ixcaroline. INTERNeX New Zealand: Meet the fun team! INTERNeX New Zealand: New team member!